It’s noon. At least that’s what my watch tells me when I give it a glance as our bubbly waitress at The Farmhouse at Jessup Farms carefully places a small taster of beer in front of me. It’s Sunday; boozy brunch day. Filtered curtains of light stream over the rustic brick walls of the historic farmhouse-turned-restaurant. For most of the sleepy diners around me, the day is just beginning — yet delicate glassware filled with beer made from the area’s 30+ craft breweries adorn most of the tables in the room. I guess when you live in a beer-blessed city like Fort Collins, there’s always room for beer at the table. 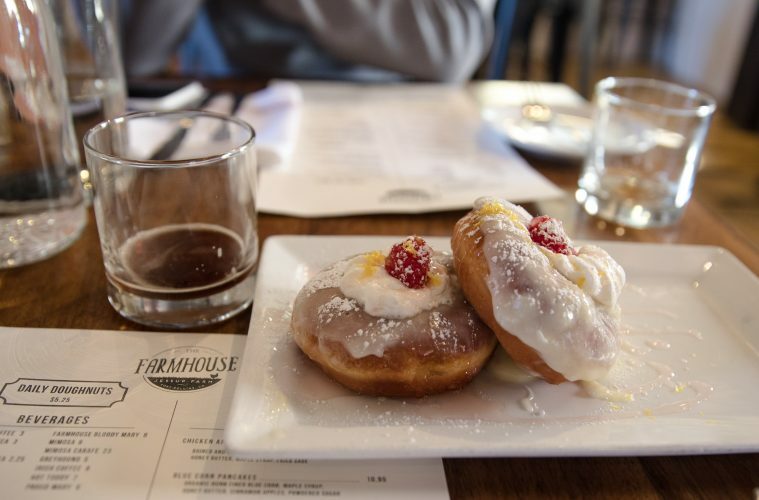 The dark hue of my slightly tart, barrel-aged imperial brown ale from the nearby Jessup Farm Barrel House adds a nice contrast to the bright and gooey, icing-covered plate of donuts in the center of the table. Pretty pops of color from fresh raspberries and vivd slivers of lemon peel on the baked treat demand attention and admiration in the busy room. I take a bite, then a sip, and savor the tart, yet sweet complement of flavors. If boozy beer brunches are the norm in Fort Collins, just consider me a local.